SEOUL, Dec. 23 (Korea Bizwire) – Prime Minister Hwang Kyo-ahn said Wednesday that the government will put all-out efforts into parliamentary approval of labor reform bills to create more jobs. Hwang described job creation as a major government task at the moment. The government has since pressed the rival political parties to approve the bills on labor reform, noting that the bills could help create about 370,000 jobs over the next five years. 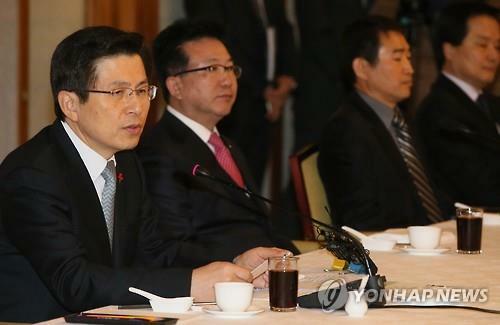 “Job creation is the biggest social contribution of the companies and the road to patriotism,” Hwang said during a luncheon. Business groups have also called for resolving the parliamentary deadlock, saying that the prolonged legislative impasse could hamper their efforts to create more jobs and boost the sluggish economy.